If you’re looking for an exciting way to spend the weekend, then look no further than AMT! We’ve got three super shows to choose from. But, why choose? Treat yourself to a full weekend of great entertainment, and come to all three! First, on Friday, February 17, it’s America and Jon Anderson. Vocalists/guitarists Dewey Bunnell and Gerry Beckley, the founding members of iconic folk-group America, have reason to celebrate these days. On Monday, February 6, America celebrated their 40-year career milestone with a star on the Hollywood Walk of Fame. In addition, Time Life released new, acoustic versions of their biggest and most treasured songs recorded during their 40th anniversary year at the legendary Troubadour club in Los Angeles. America and Jon Anderson – Friday, February 17 at 8:00 pm – Click here to get your tickets now! 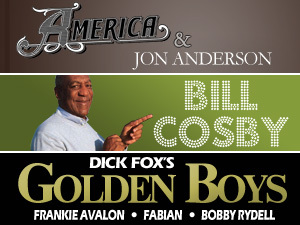 Bill Cosby – Saturday, February 18 at 3:00 and 7:00 pm – Purchase tickets here! The Golden Boys – Sunday, February 19 at 7:00 pm – Click here for tickets!